Victoria, (Saanich) BC. 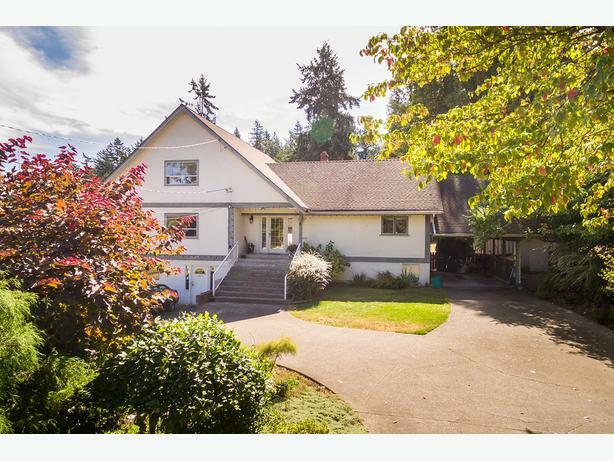 Rare find, minutes to Pat Bay Hwy, ferry and downtown Victoria. This spectacular flat sunny 6+ acre estate offers an incredible opportunity to create your dream home! Featuring over 4800 sq.ft. of living space with a flexible floor plan. Sept. 2017 Appraisal; $2,100,000. Beautifully maintained, with large bright rooms, perfect for entertaining. 5+ beds + den, open gourmet kitchen, glistening hardwood floors, inserted carpets, master ensuite with sunroom, enchanting nooks and crannies, amazing storage. Ocean glimpses from the upper level, lower level has wrap around sunroom, Excellent suite potential. Outside you will find a solid large barn with loft and stable/workshop. Hay fields - current owner has had farm status for years. Minutes from the city, Island View beach, airport, ferries, schools and busses. lots of parking, A1 zoning, in ALR. Visualize your dream, your heaven on earth Winery Estate??? Offered by JONESco Real Estate Inc. Call today for an appointment to view.